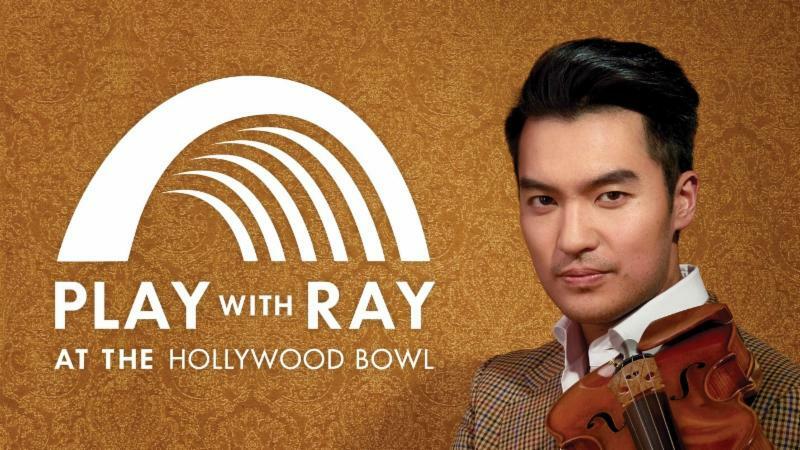 March 22, 2019, 2:00 PM · This is the stuff of dreams -- you are performing the Bach Double, with the fab and famous violinist Ray Chen, in front of 18,000 people at the Hollywood Bowl! It's actually a possibility, because the Chen and the Los Angeles Philharmonic have just announced an international Play with Ray Competition, open to non-professional violinists of all ages. "I want to provide people around the world a fun, once-in-a-lifetime opportunity," Chen said. "People who have a dream to perform on stage, this project is for you. I couldn’t think of a better partnership to help realize everyone's passion for music than the LA Phil at the Hollywood Bowl." Those wishing to enter must submit a video of themselves playing the first violin part of J.S. Bach's Concerto for Two Violins in D minor (that's the one at the end of Suzuki Book 5), along with an application that includes an essay. It is free to enter! See this page for all the information to enter. The winner will be flown to Los Angeles, put up in a nice hotel, and will perform the Bach Double with Chen and Los Angeles Philharmonic, led by Ben Gernon, on August 8, 2019 at the Hollywood Bowl. The concert will be livestreamed on Facebook and YouTube. The winner will have the option to play on a rare violin provided by Tarisio, and to attend masterclasses and concerts in the days leading up to the concert. Chen has provided a video (on this page so that violinists who wish to apply can practice playing the piece, right along with Chen! March 22, 2019 at 08:12 PM · As Alma Deutsher might say, "Interesting...."
March 22, 2019 at 08:13 PM · Cool! March 23, 2019 at 03:23 PM · What an awesome idea! Since I recently performed the Bach Double with my community orchestra, I thought "why not enter?" March 23, 2019 at 05:34 PM · Wow! You are fast! :) Good job! March 24, 2019 at 06:49 PM · Laurie writes that it is for nonprofessionals, but the contest website explicitily states that this is for all levels. All means all. I find that very confusing. No, Hilary Hahn is not going to participate in the contest. But an ambitious young soloist not yet known but playing at top level may think of participating? Or a child, a prodigy, dreaming of performing with her hero? And then the enthousiastic amateur with an interesting background story to tell? I expect it will be quite a mix, the three finalists. March 24, 2019 at 07:27 PM · By the way Gene, you seem to be a pretty good (meaning, really great ;-) amateur! Your violin seems "pretty good" too, certainly you can get a nice sound out of it. March 24, 2019 at 10:43 PM · Non-professional just means that you aren't making a living, ie. being paid, as a violinist. March 25, 2019 at 04:56 AM · Jean -- Thanks much! I already had the Bach Double prepared and ready to go, so I figured I'd just throw my name into the hat. I don't expect to win, but if by some miracle I do, it'll be a dream come true. My violin is a 2013 Jay Haide (à l'ancienne model made with European wood) that I purchased from Ifshin Violins in El Cerrito, CA. March 25, 2019 at 04:57 AM · Thanks, Xiaobin!